Got a picture with a special memory for you? It might be funny, sad or wise. Maybe with someone famous, or a lovely family photo. Share it with iScot. There is only one thing that determines my approach to a second independence referendum and that is winning it. Losing again is simply unthinkable and we have to ensure that we are as pragmatic as possible in ensuring that next time we get over the line. That means we have to have a new case that is sufficiently persuasive to convince those amongst our fellow Scots who voted No last time and we must ensure that it is held under the optimum conditions for success. 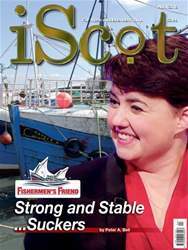 iScot issue # 40 - April 2018 is now available to download - we apologise in advance for the sensitive nature of the front cover and suggest that one displays the issue face down on one’s coffee table. Who, or what, is the Lord Lyon?